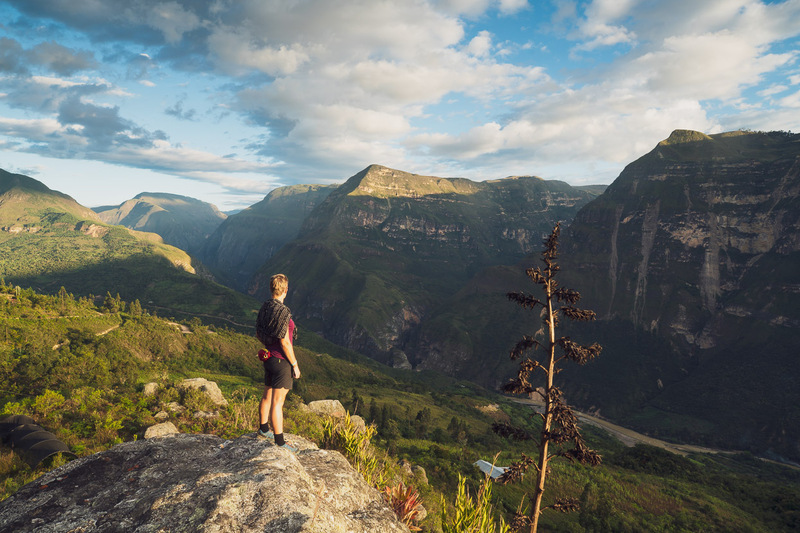 Our first seven days in Perú have been an amazing contrast to the landscapes and culture that we left behind in Ecuador. 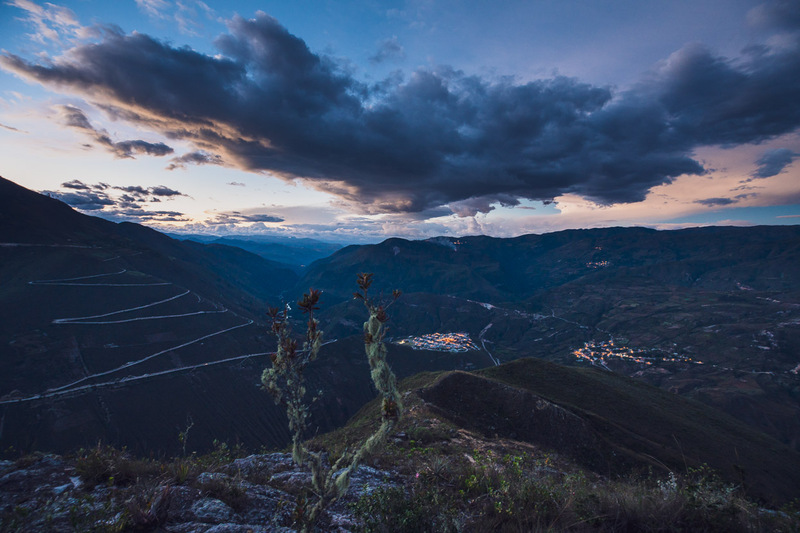 As we neared the border we dropped lower and lower, out of Ecuador’s chilly high country and down to a record (for the past few months) low of 800 metres. 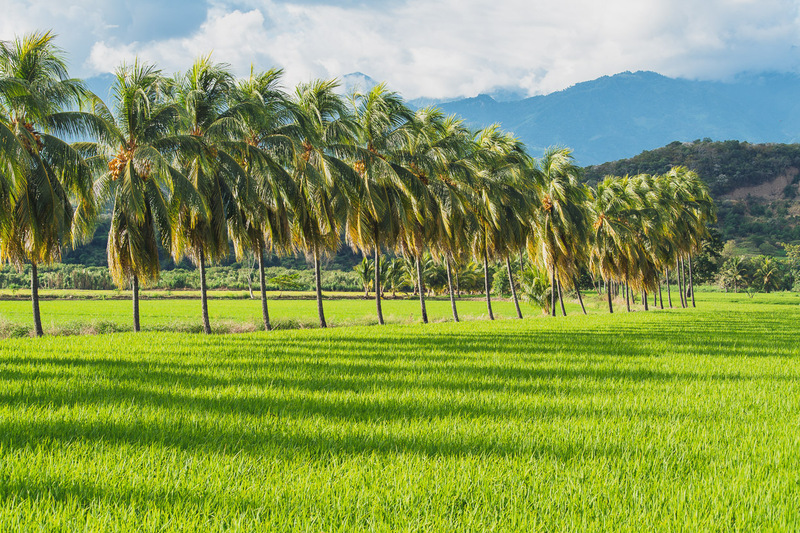 The warmth that comes with lower elevations has been welcome as we’ve left behind the llamas and found ourselves surrounded by rice paddies, watermelon and mangos. 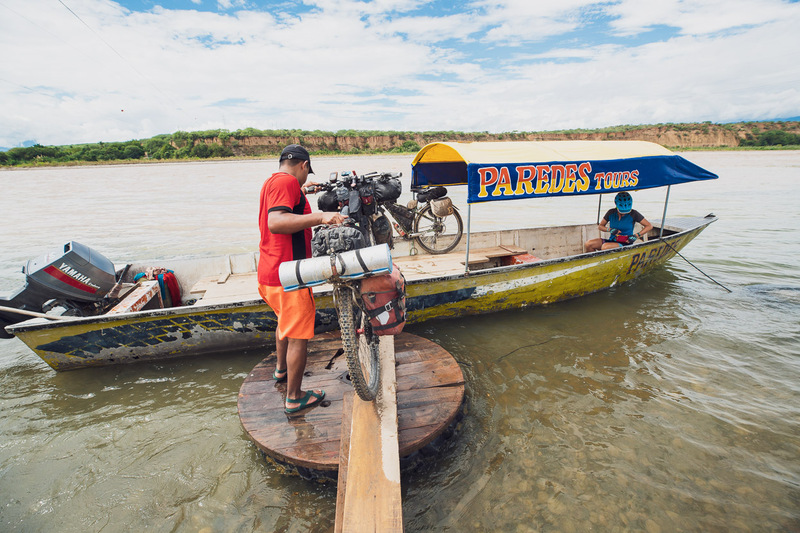 As we’ve ridden through the towering canyon of the Utcubamba River, our riding days have been a little shorter than normal as we hopped between the spectacular sights and archaeological ruins of the Amazonas Department. 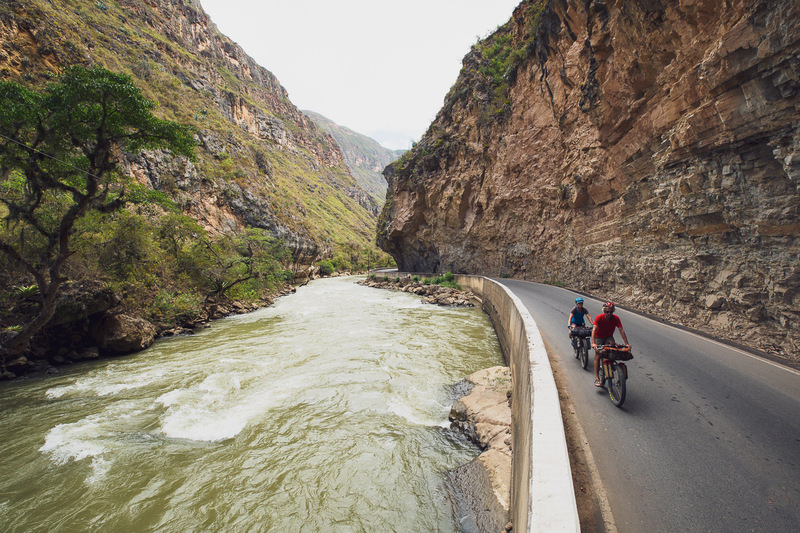 Uncharacteristically for us, the riding has mostly been on pavement, but this is about as good as paved touring gets; with epic scenery, good roads and little traffic. 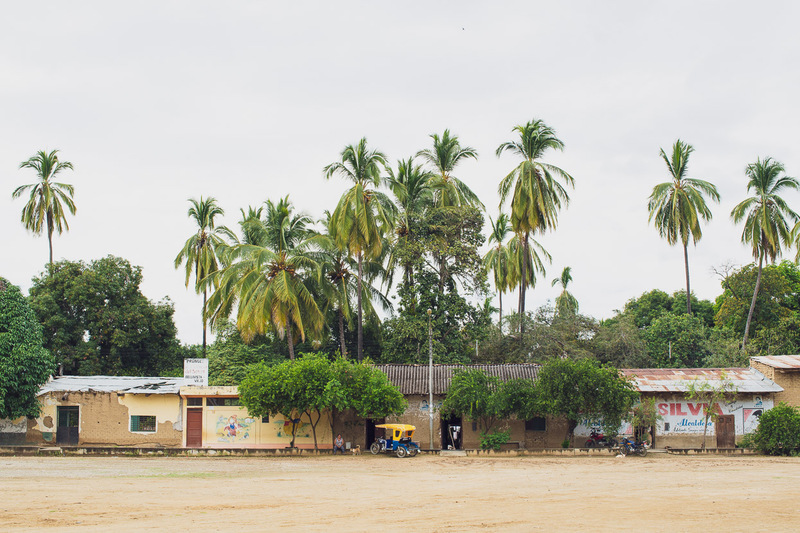 After crossing the border at La Balsa, rolling hills and paved roads led the way, as we passed by villages industrious with drying coffee and cacao. We’re still riding in the good company of Rich Lytle, who here is eagerly awaiting his first Peruvian meal in Nambale. And it wasn’t too bad, except for the weak coffee. 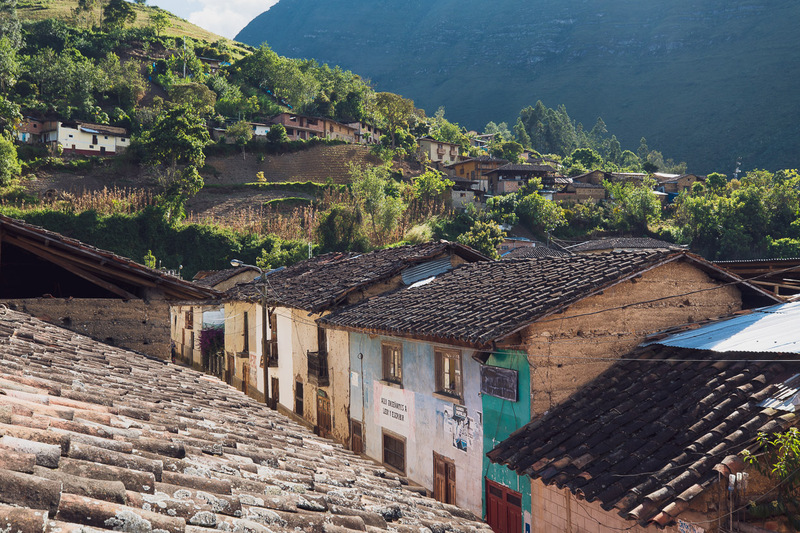 The heat has us guzzling soft drinks – Inca Cola being the sickly sweet local brew. 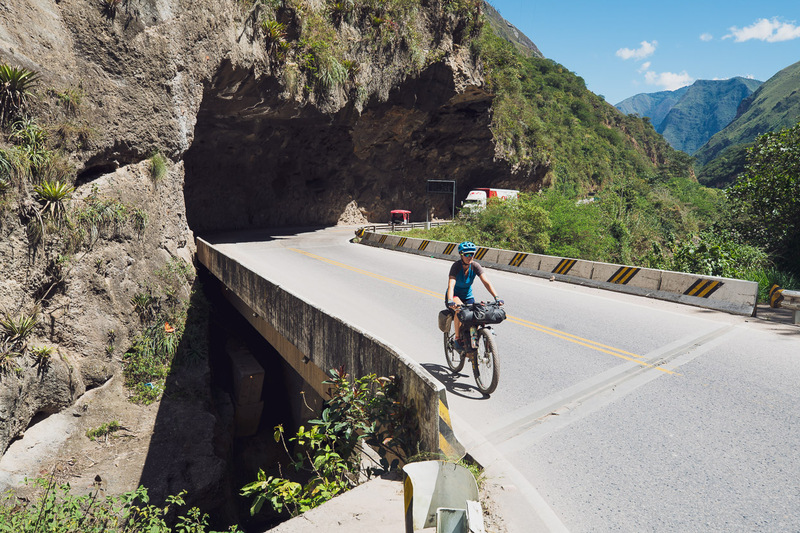 After a night in San Ignacio we followed the paved highway 5N out of the hills and into the Chinchipe Valley for a rare, mostly-flat afternoon of cycling. 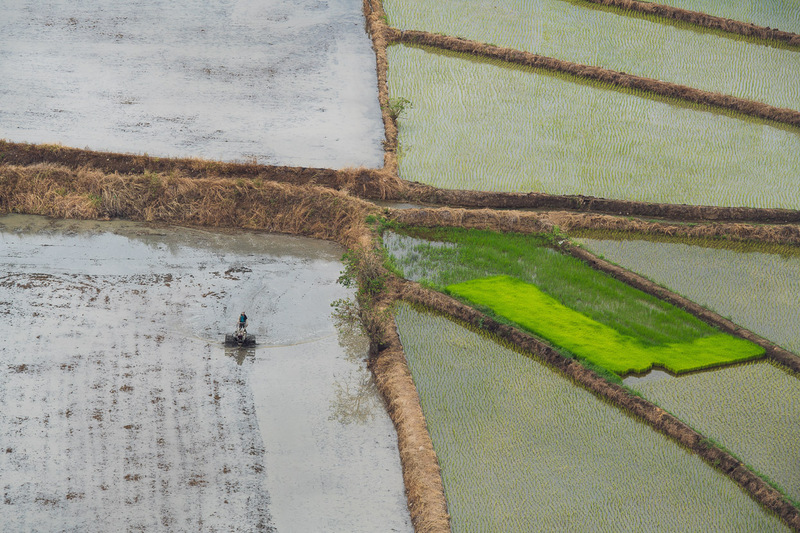 The lush green of the rice paddies a contrast to the otherwise quite arid landscape. It had been a solid few days of mostly hilly riding since Vilcabamba so we took a day off in the lively town of Jaén. 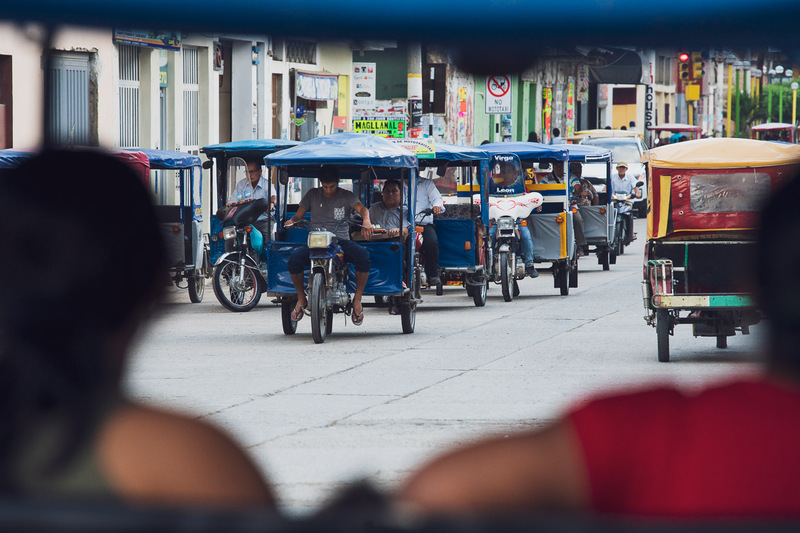 Our first introduction to a large Peruvian town, which in many ways reminded us of China, especially with its frenetic moto-taxis, busy streets and haphazard urbanity. In contrast to the town’s rough terracotta brick buildings the plaza, with its unique church facing one side, was the heart of the city. In the evenings it would fill with people, socialising and enjoying the cooler evening air after the heat of the day. It reminded us a lot of the busy plazas in Mexico’s cities. 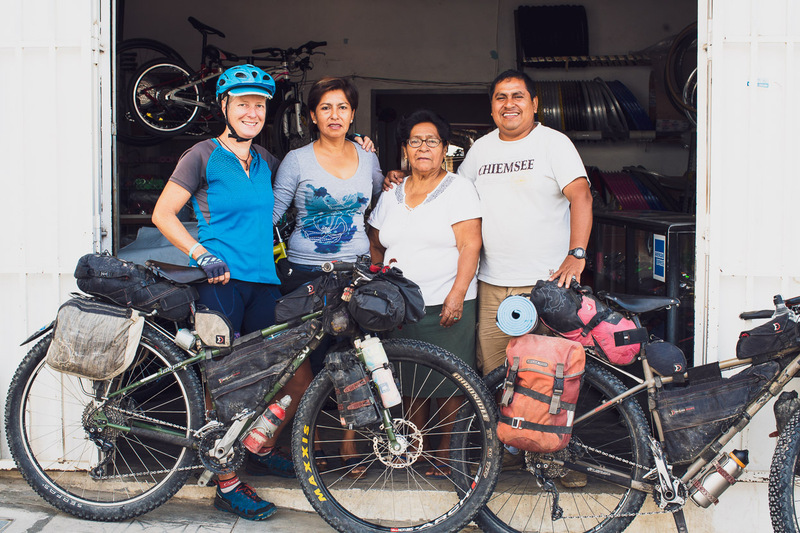 Hana’s bottom bracket was getting a bit rattly so we dropped into the best bike store in town (El Ciclista) run by Miguel and his family. 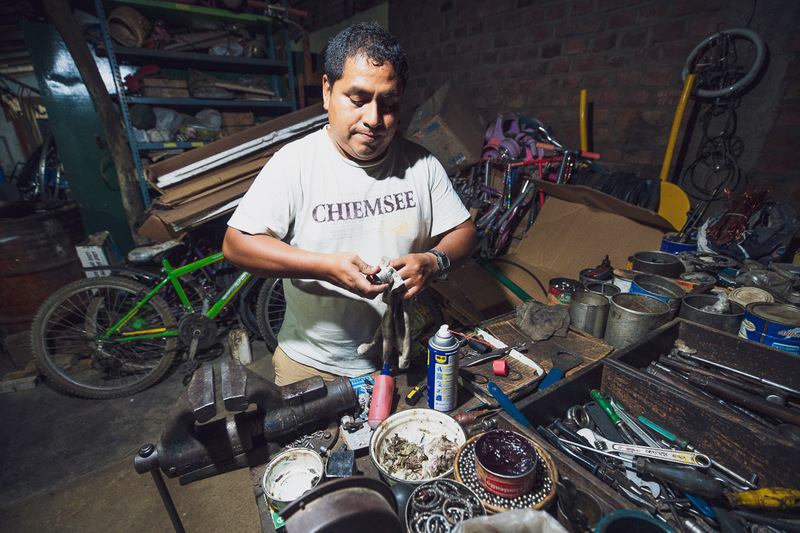 Miguel is super passionate about bikes in general and meticulous in his work. 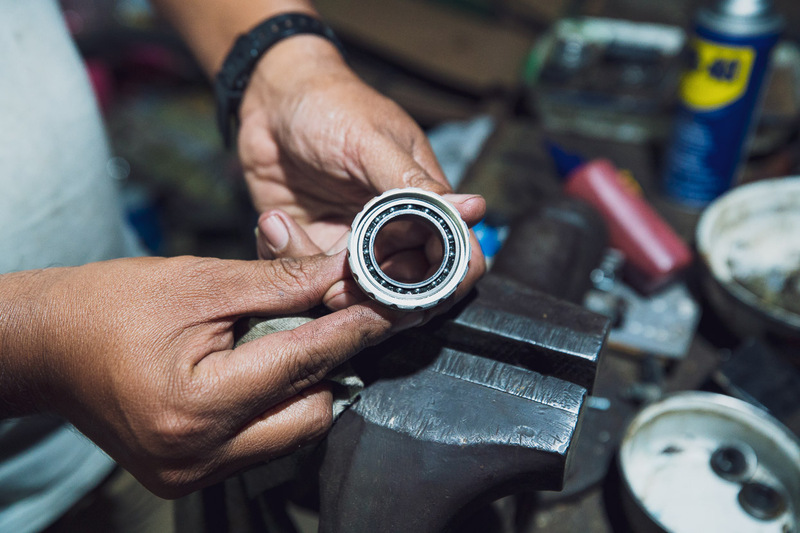 They’d never seen Hope Technology hubs before – but knew about their distinctive clicky freewheels, so much wheel spinning was done to hear the crisp sound of their freewheels spinning. 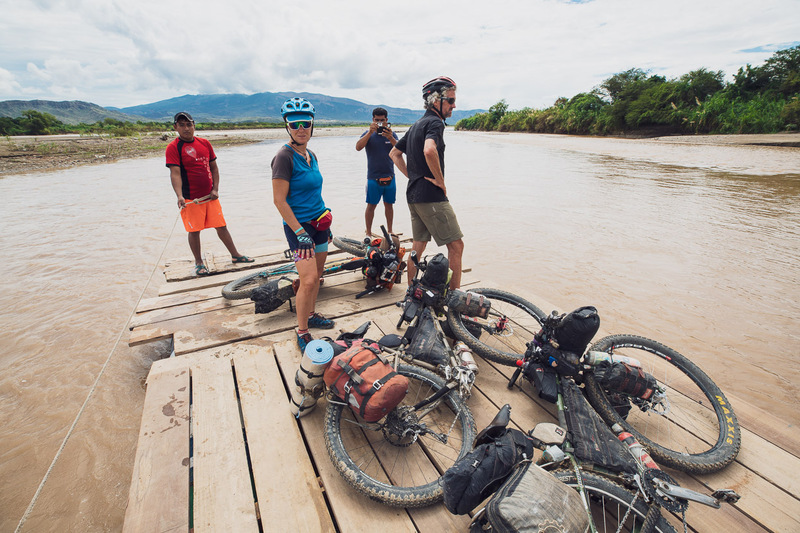 We took a good back road out of town to connect with the ferry crossing over the Rio Marañon. 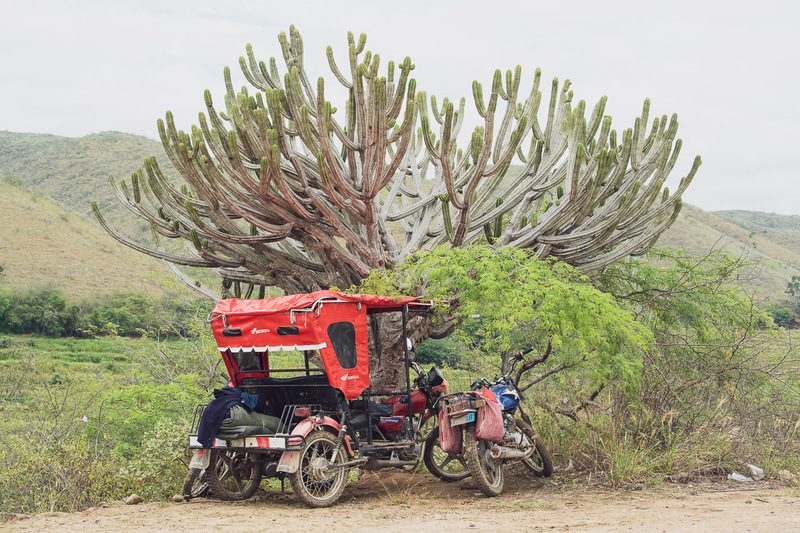 This road doesn’t appear on OSM maps, but it’s on Google Maps and takes a nice narrow dirt road through a valley filled with rice paddies and cactus covered scrubby hillsides. We popped out in Bellavista Viejo and then the outskirts of Bellavista proper. A pungent scent caught our noses as we cruised down the road towards the ferry. 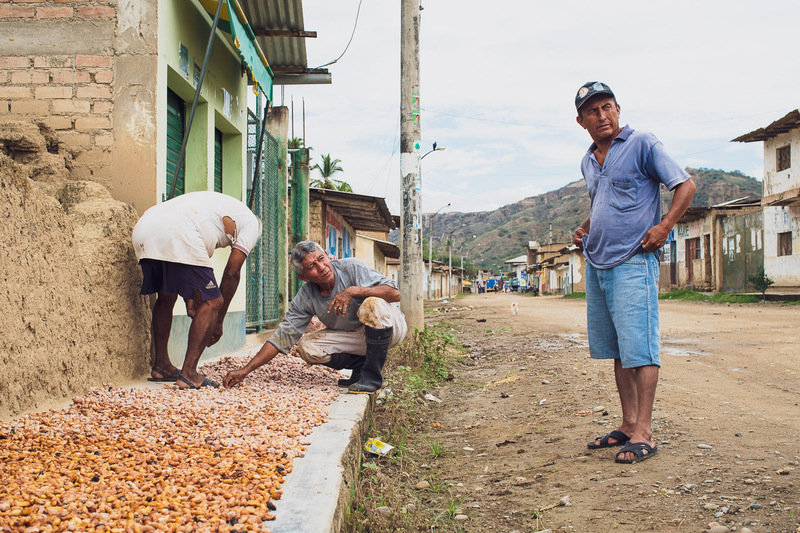 These men were spreading thick globs of fermenting cacao (cocoa) fruit on the footpath to dry and rot the fruit off the seeds, before sending it to market. 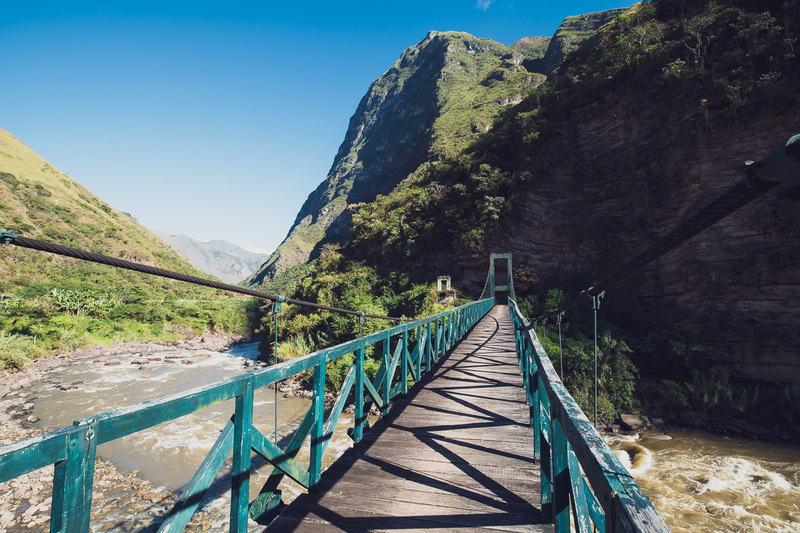 Crossing the Rio Marañon. At about the point we crossed this wide river deviates from its NW course and makes a huge arc to the east, towards Brazil, where it drains into the Amazon. A second braid is crossed on a raft made from 44 gallon drums. 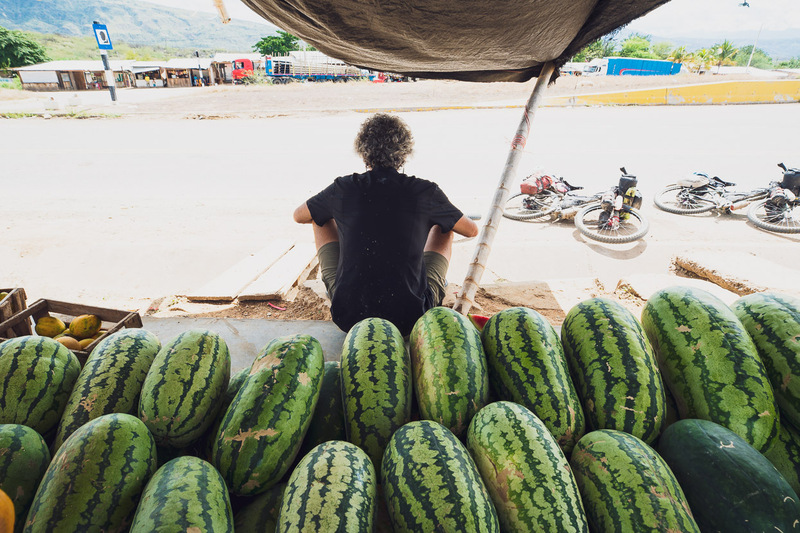 From there a bumpy dirt road fed us back to the highway, where a watermelon and mango stall with the biggest melons I’ve ever seen was a welcome sight in the high 20s heat. 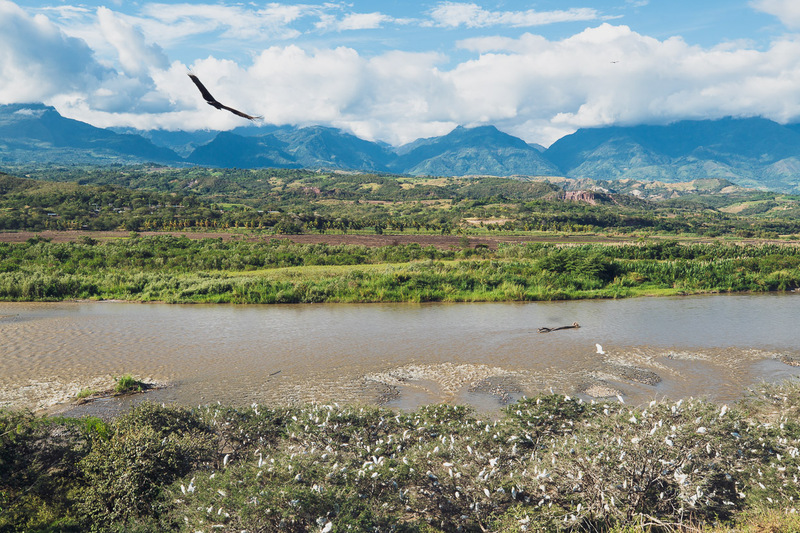 After crossing the Marañon, we started our way up another river system – the Utcubamba – following the 5N. We’d be following this river for the next few days as we made our way upstream. 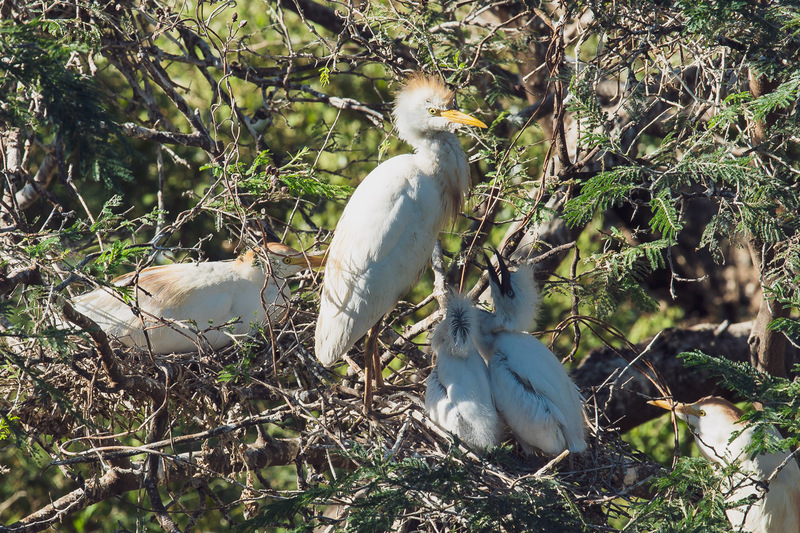 In the late afternoon we passed thousands of nesting egrets, chattering and flapping around in the trees. Lots of nests with babies. 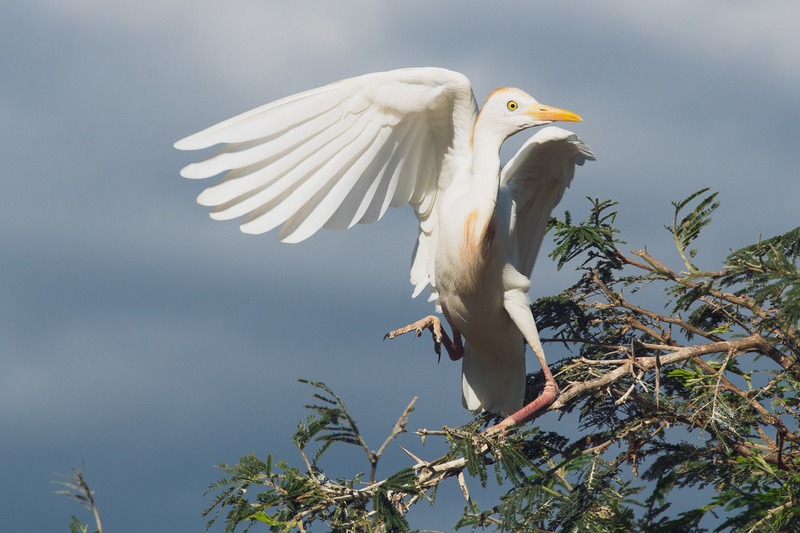 They’re not exactly graceful birds – more gangly and awkward. Add a person in a conical hat to this scene and you’d be in Vietnam. We ate at a roadside restaurant that evening and then pressed on up the valley in gorgeous light, hoping that the ideal campsite might materialise. 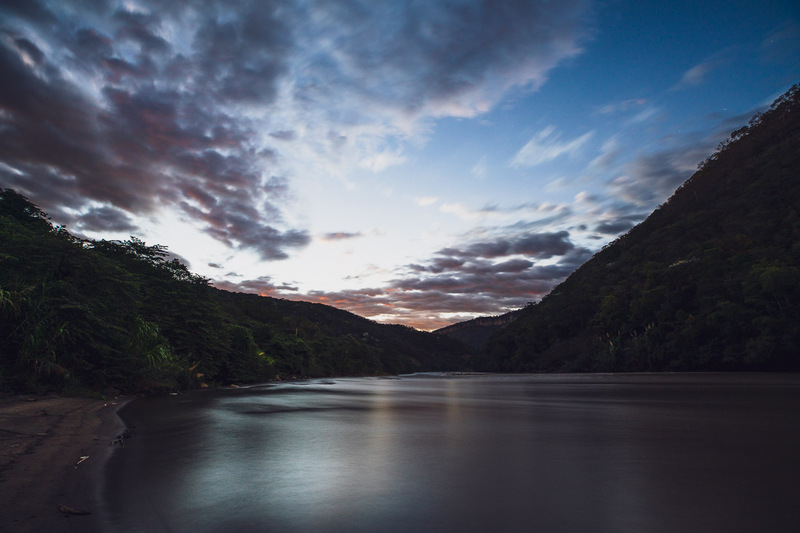 And sure enough just after sunset we found the ideal riverside spot, which we shared with a couple of local fishermen who fished until well after dark. A grumpy old man came along early in the morning and told us off for camping there, though I doubt he actually had any right to as we came down a side road and were camped on the beach. 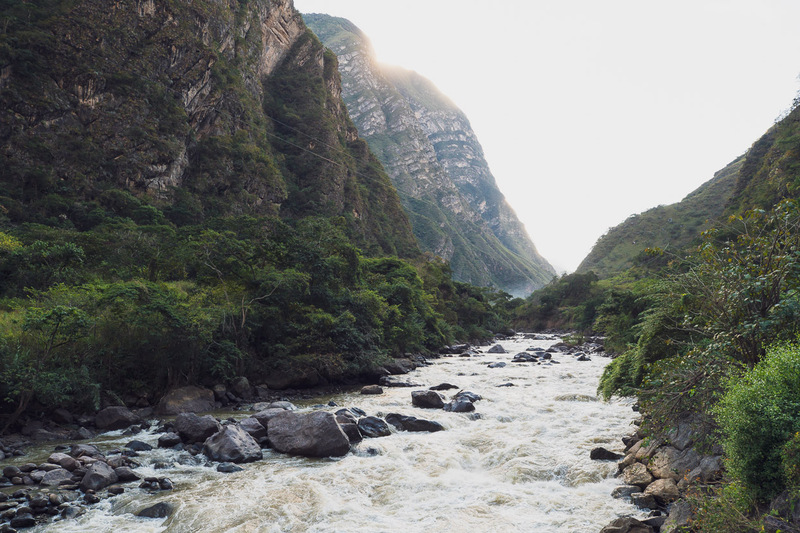 The Utcubamba Valley closed into a canyon as we headed upstream on a good paved road, the river roaring over boulders below. We passed the odd pedestrian bridge, accessing villages hidden in the valleys on the other side of the river. In places the road way has been blasted deep into the cliffs. 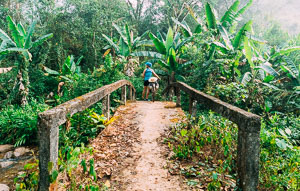 In the afternoon we turned left off the highway and rode 6km up a mellow dirt road to the village of San Pablo, one of two access points for the famous Gocta Falls, that we’d come to see. The village (although in the midst of a three day festival) was a very low-key place to hang out. One hospedaje and restaurant, and we very much had the feeling that we were the guests of the village. There was only one other tourist about. 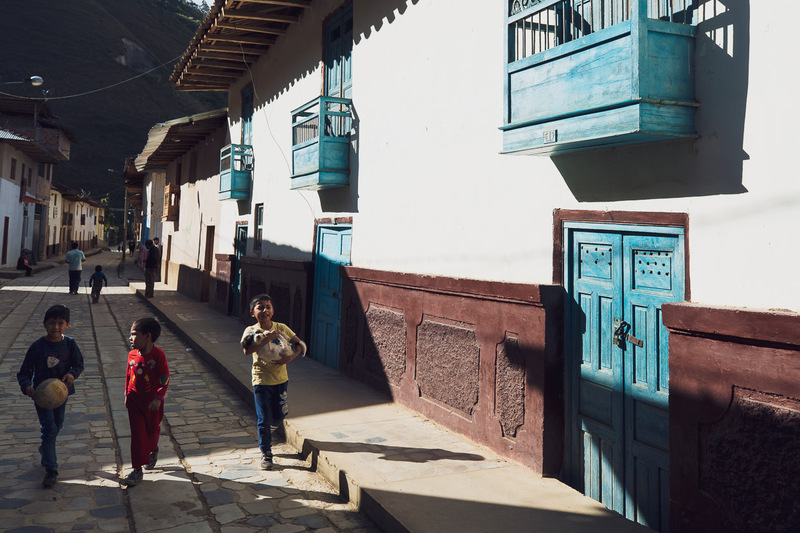 Most people walking to the falls go from Cocachimba, on the other side of the Cocahuayco Valley, as it has a bit more tourist infrastructure and is a shorter walk right to the base. But we wanted to walk the loop, taking in both sides of the valley and several viewpoints. San Pablo also has a fantastic view out over the main canyon. Colour from sunset lingered in the cloud as the full moon rose early in the evening and lit the canyon. The pueblo of San Pablo. 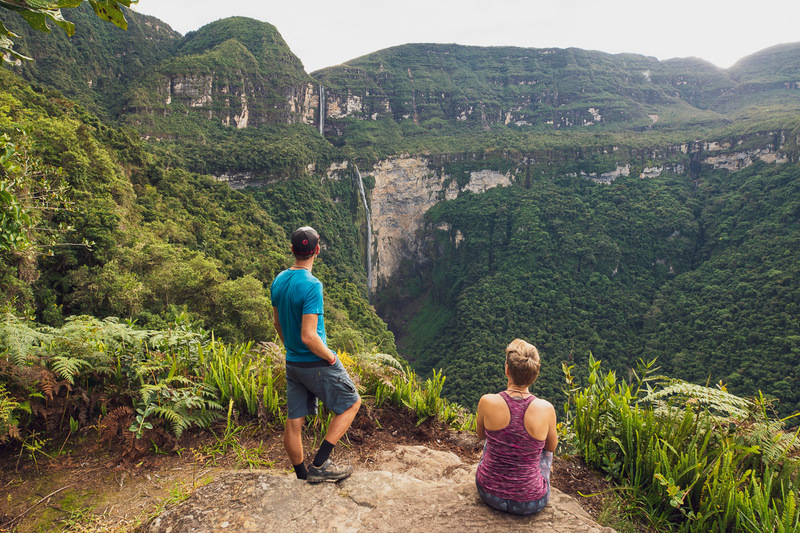 We left early in the morning and walked for about an hour and a half to the first mirador with views of the impressive Cataratas Gocta. 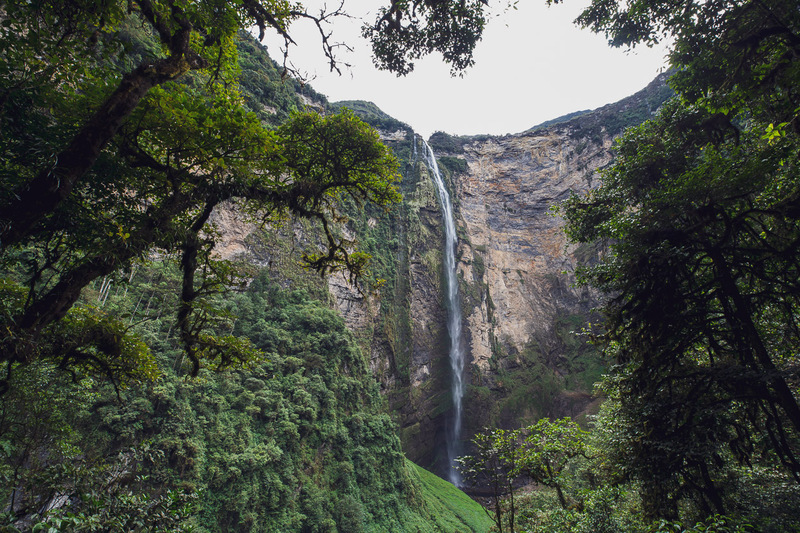 These falls tumble 771 metres in two drops and are the 16th tallest in the world, and the highest in Perú. Reportedly, they were only ‘discovered’ in 2002. 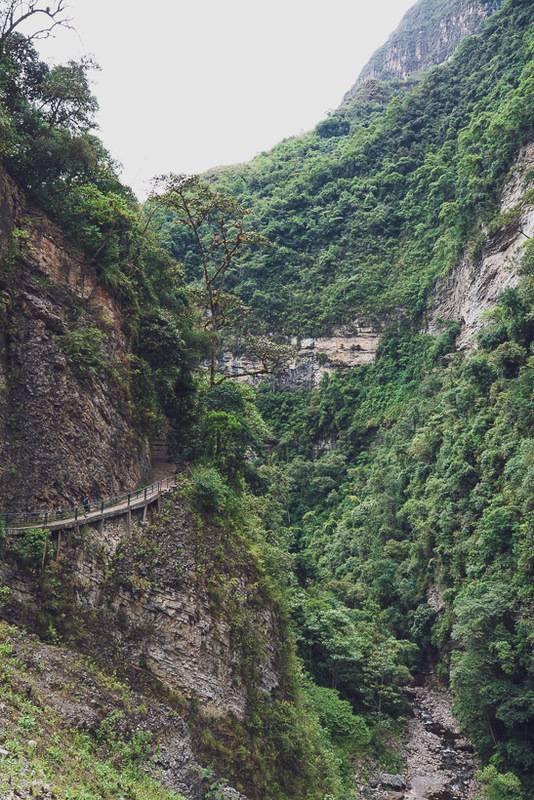 Although well known to locals, the falls are hidden from view of the main highway deep in the canyon below and hence had not been visited by outsiders. 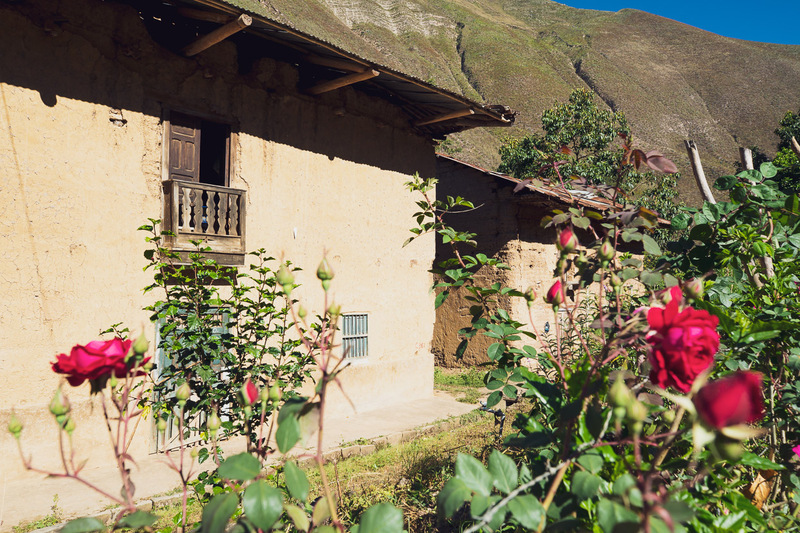 Now, they’re one of the most popular sites in the valley to visit, along with a wealth of pre-Inca burial villages and burial sites. Our hike dropped steeply into the valley, crossed the river and then climbed gradually up a path on the true left. The views get more and more impressive as you go. 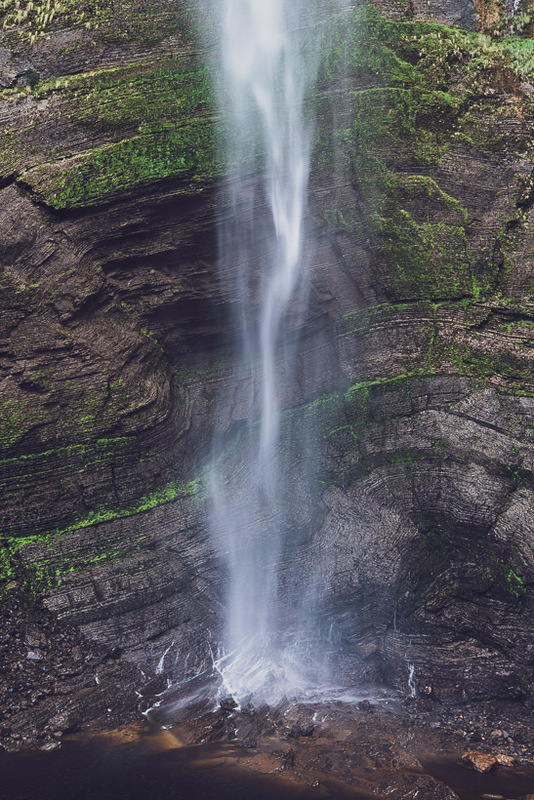 By the time the falls near the bottom of their final 550 metre drop the water has turned into an ethereal, ghostly mist that floats to the ground in pulses. You can stare at it for hours. We completed the walk in Cocachimba and caught a moto-taxi back to San Pablo, where we spent a night of broken sleep as the pueblo’s fiesta kicked into gear with fireworks, a brass band (that broke into song quite randomly through day and night) and another deafeningly loud live band. 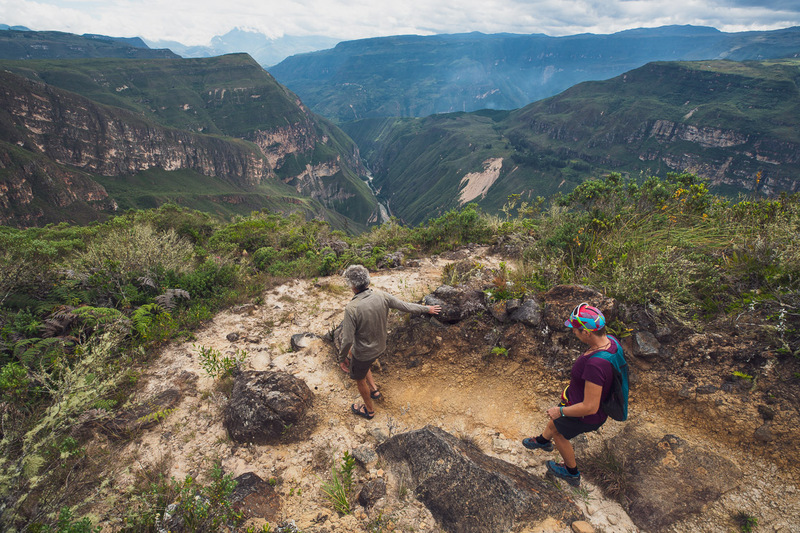 The next day we rejoined Rich on the highway (he’d stayed in Cocachimba instead) and headed up valley for a short hop towards the town of Chachapoyas. 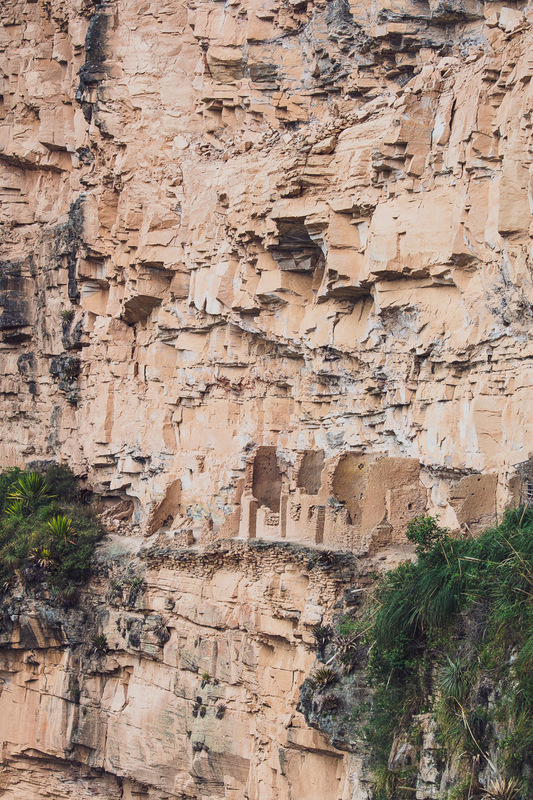 By now the canyon walls tower overhead with cliffs of streaked limestone dotted with cactus and agave. 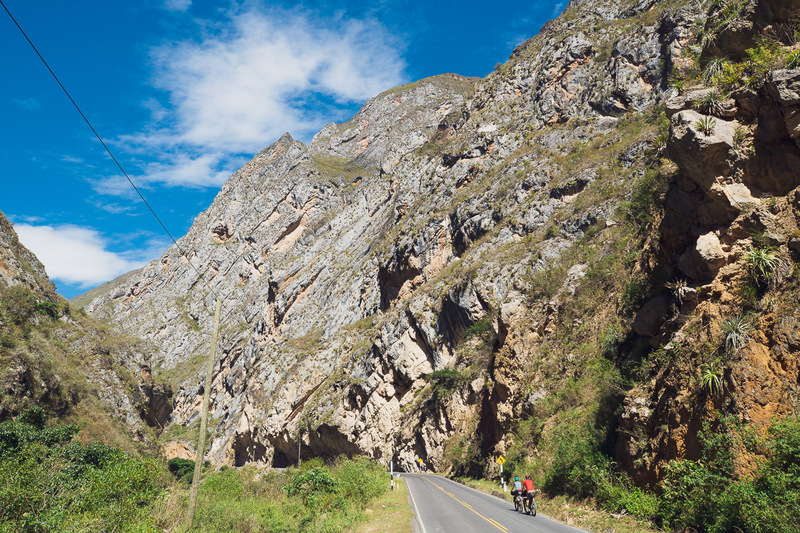 Chacapoyas is a nice, medium sized town spread over a basin high on the side of the Utcubamba Canyon. 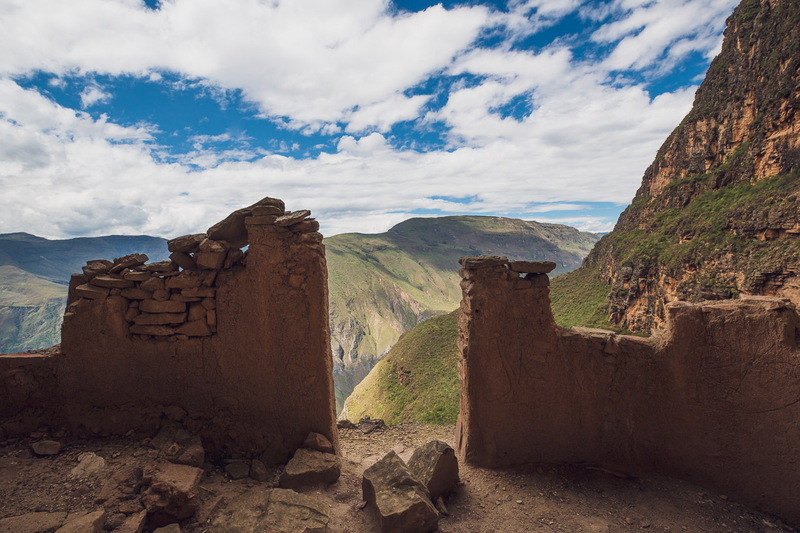 It’s named after the pre-Inca people who thrived in these valleys. 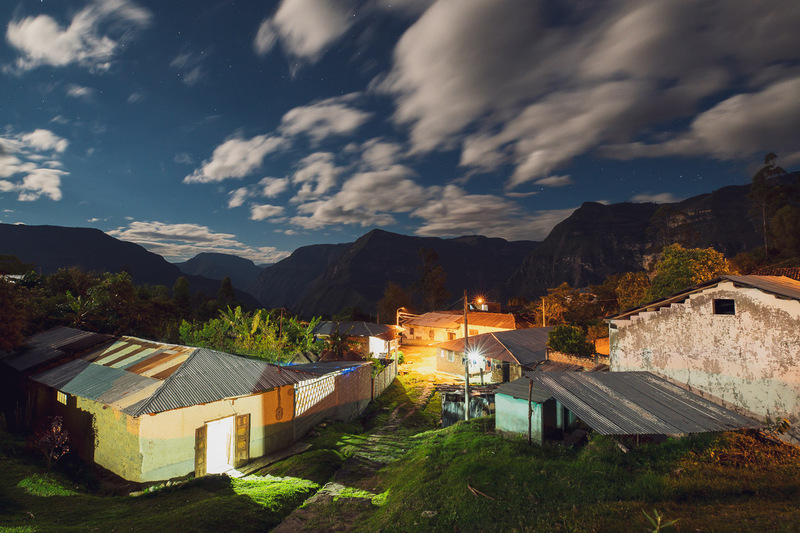 ‘Cloud people’ is the literal translation of Chacapoyas. 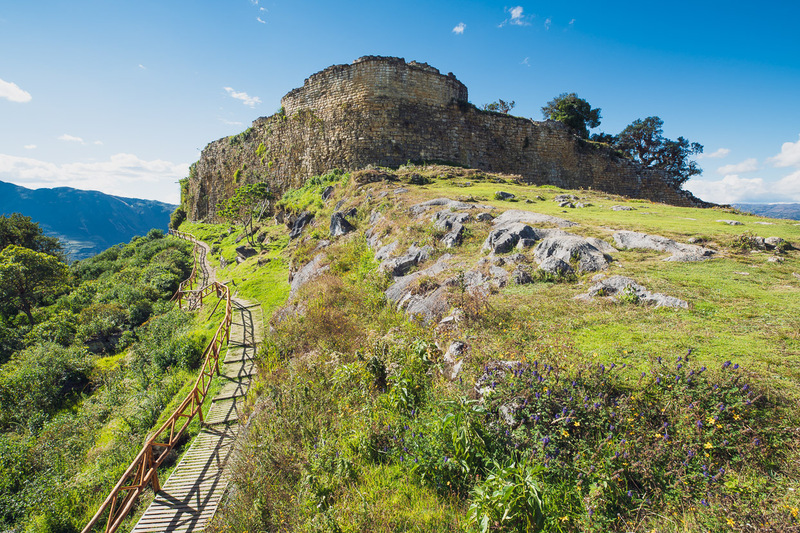 For most people, including us, it’s a relaxing tourism base to explore nearby archaeological sites. 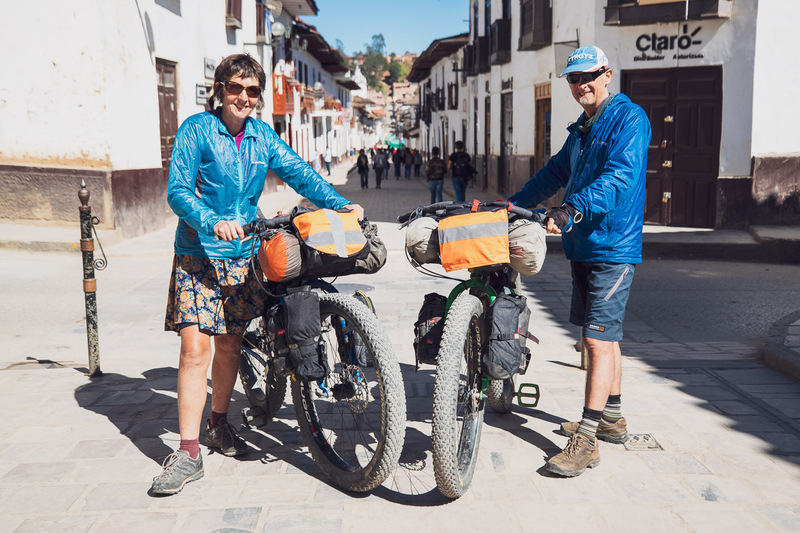 We were lucky to be able to coincide our arrival with that of Jo Haines and Alan Cutler, a couple of hardy, light-travelling bikepackers – and fellow Kiwis to boot. 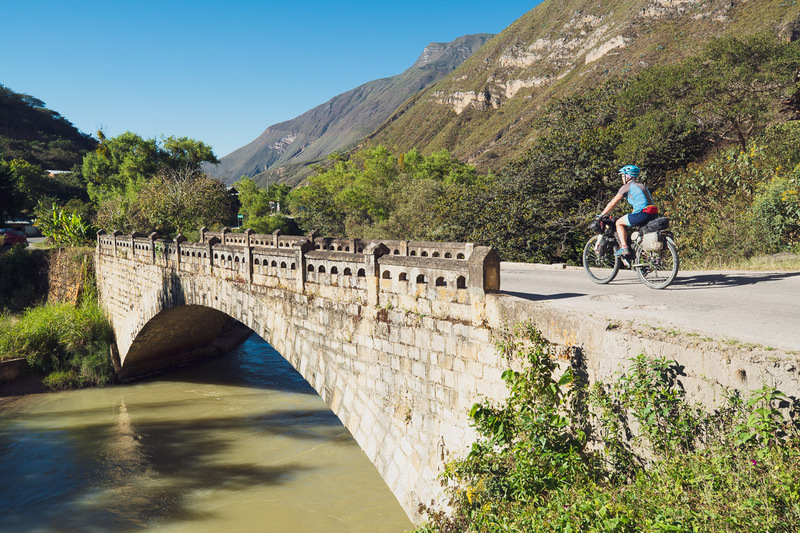 Jo and Alan started their current three-month trip in Huaraz and are headed north, to finish in Quito. We probably know over 100 people in common, but had never actually met ourselves so it was great to finally hang out. 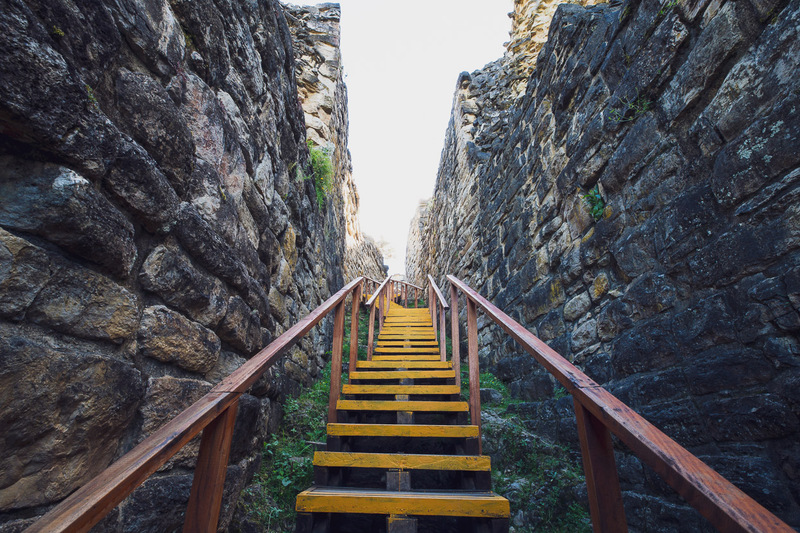 With Rich in tow too, we hit the restaurants like gannets and ended up teaming up for a day to go on a tour of two of Chacapoyas burial sites: Karajia and the Pueblo de los Muertos. 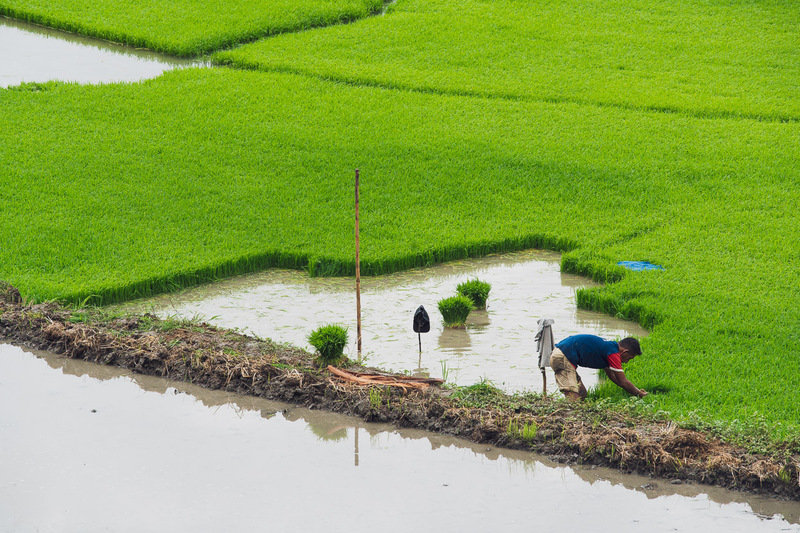 Check out Jo and Alan’s comprehensive blog. A car, with driver, for the whole day and a guide for the two sites cost us 360 PEN, so split between five people it was a very good deal for a day out. 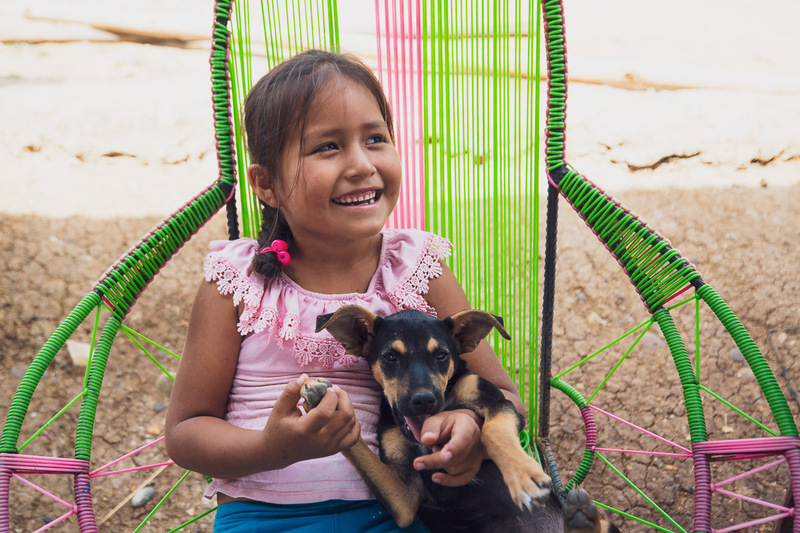 We visited the evocatively named Tingorbamba/Pueblo de los Muertos (Village of the Dead) first, driving out along a rough dirt road from the village of Lamud until we reached the rim of the canyon. From there we descended on foot down a steep trail towards the site. 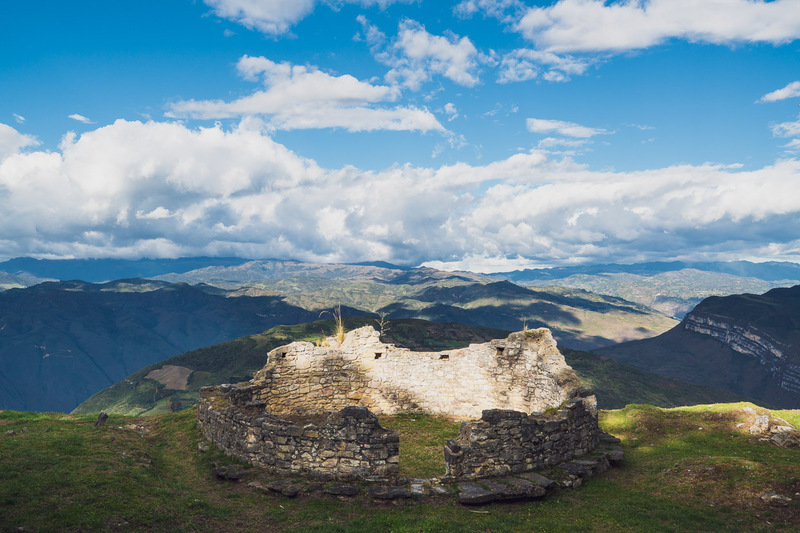 The ruins of the pueblo, which is thought to have been home to roughly 100 Chachapoyas people, are clustered closely along a precipitous natural ledge, that the inhabitants had widened in places to accommodate their 27 adobe homes. The site’s small, but is in an utterly spectacular position, poised high on the side of the canyon and virtually undetectable from above. 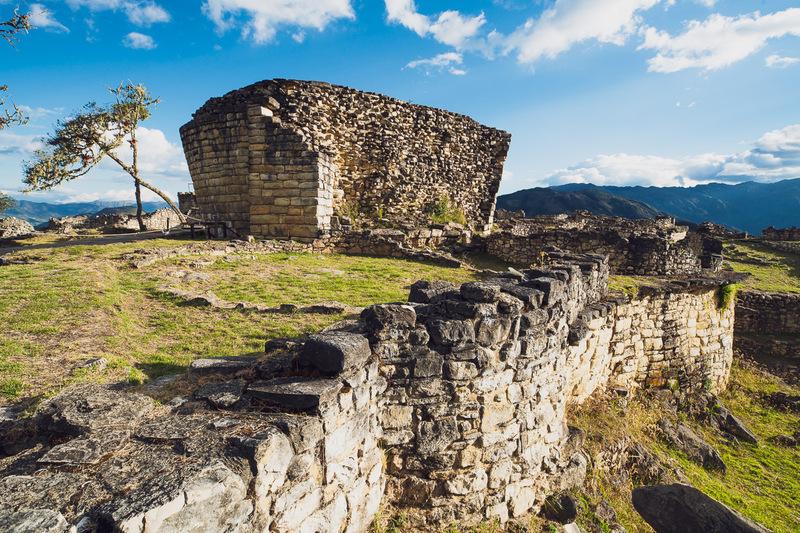 The Chacapoyas culture flourished between 1100 – 1470 AD, until they were subdued by the empire-building Inca. 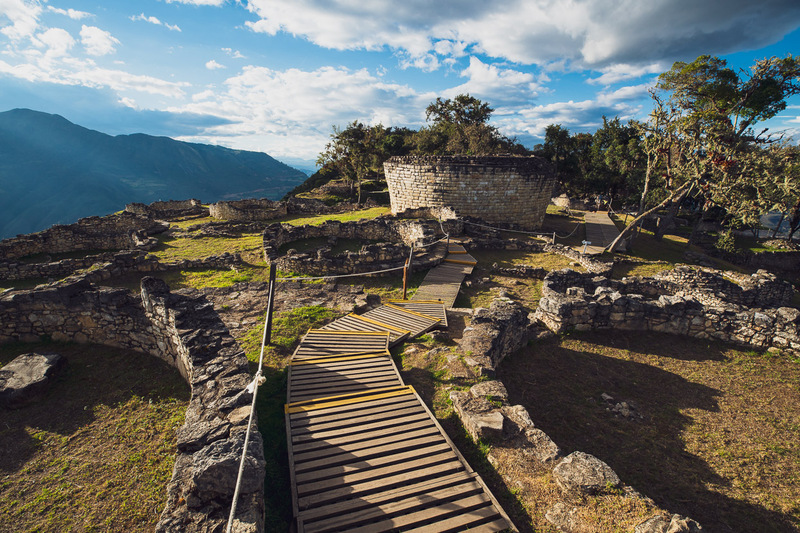 Our guide led us one by one – stepping over crumbling voids – along the narrow ledge past the roundhouses, which in places have zoomorphic decorations in the form of snakes. 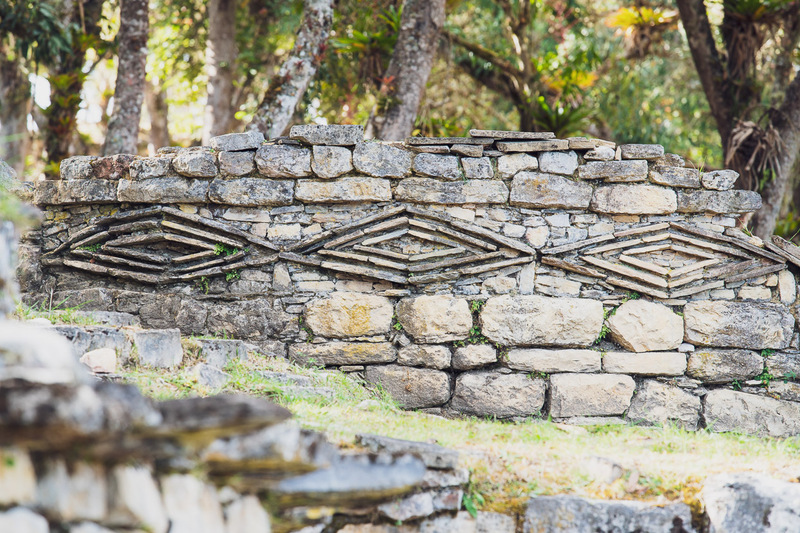 Scattered about are grinding stones, human bones and in places remain wooden fixtures used to support roofs for the homes. 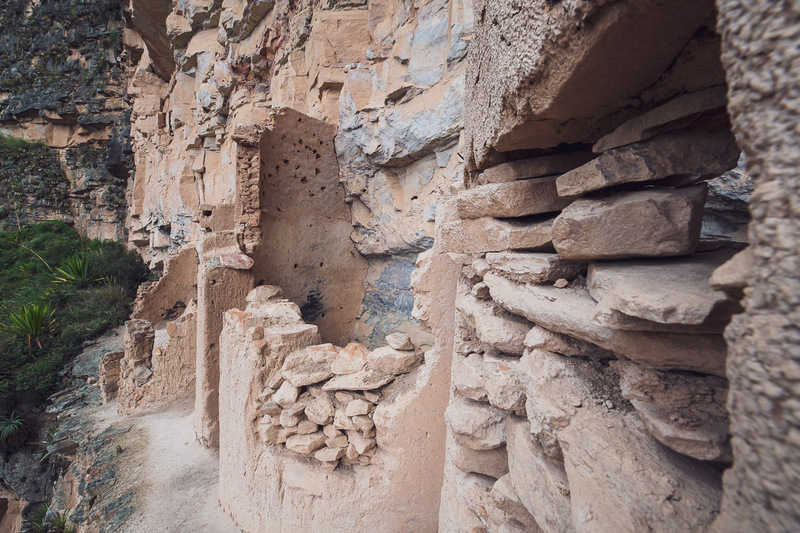 While the dry environment has preserved aspects of the ruins well, they have been desecrated in modern times by itinerants who have scrawled on the walls and broken some of the artefacts. 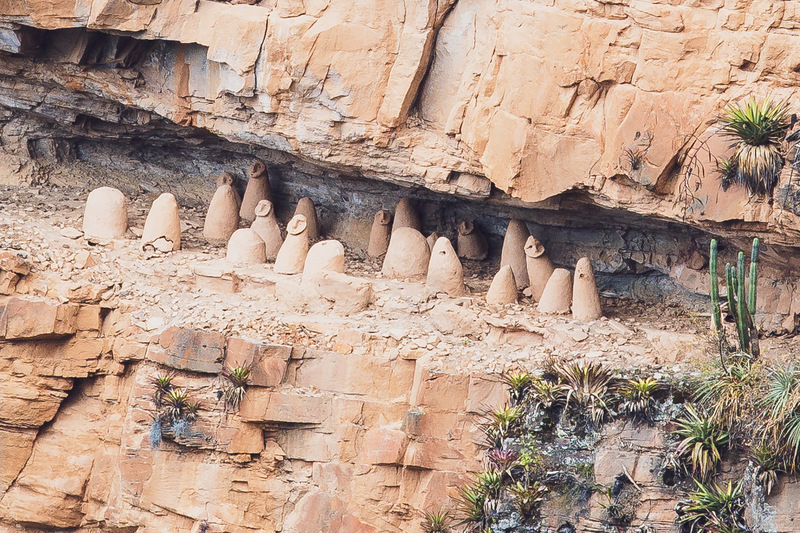 On an adjacent cliff face, on a low-roofed ledge sit a cluster of funerary structures; tombs made from sticks, rope and plaster. 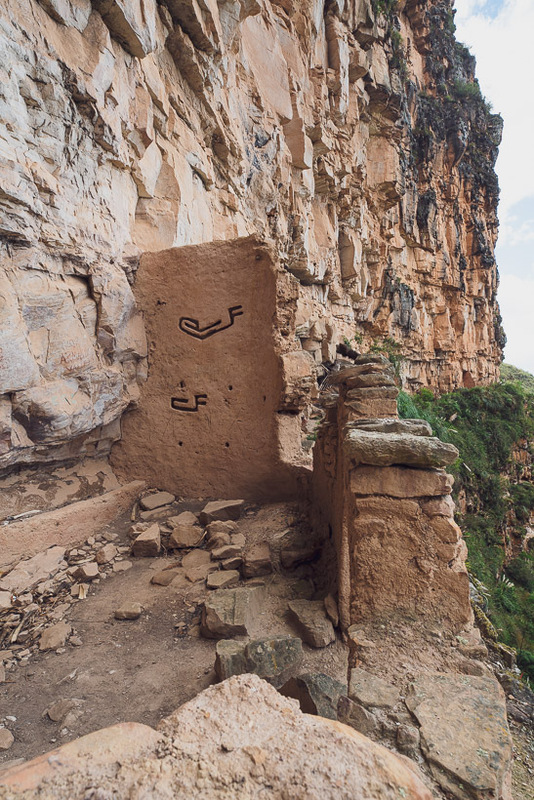 In a style that is typical for the Chachapoyas they have anthropomorphic features, with clear faces and jawlines on the top of each tomb. There were more, less featured tombs on a higher ledge that showed clear signs of being broken open and looted. A crop from the photo above. 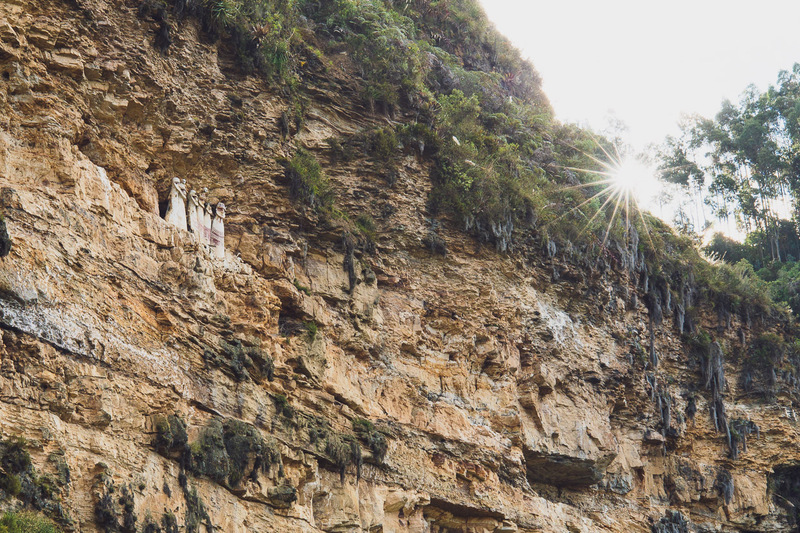 Our next stop was Karajia, a site that’s less perilous to explore, but equally interesting. 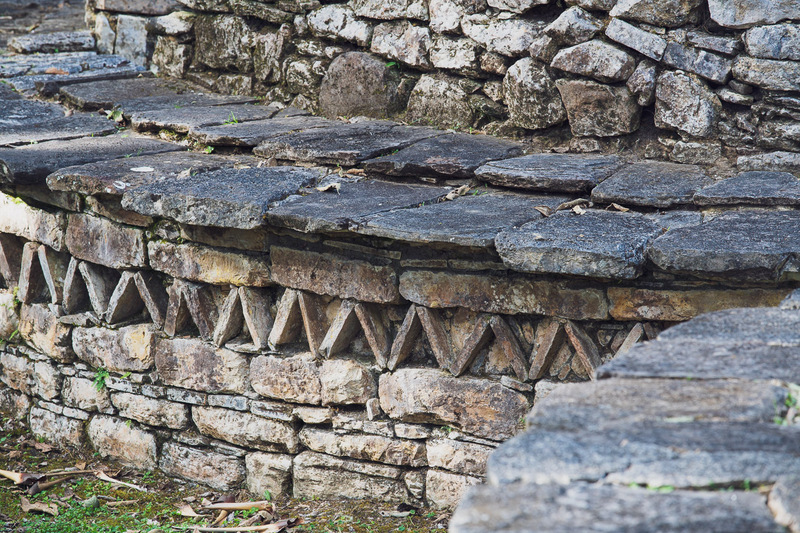 The tombs on this ledge were thought to have been positioned by means of an artificial ledge that was subsequently destroyed to seal off access. These were the tombs of royalty. A creepy touch were the human skulls positioned on the top of two of the tombs, though to be headhunting trophies. 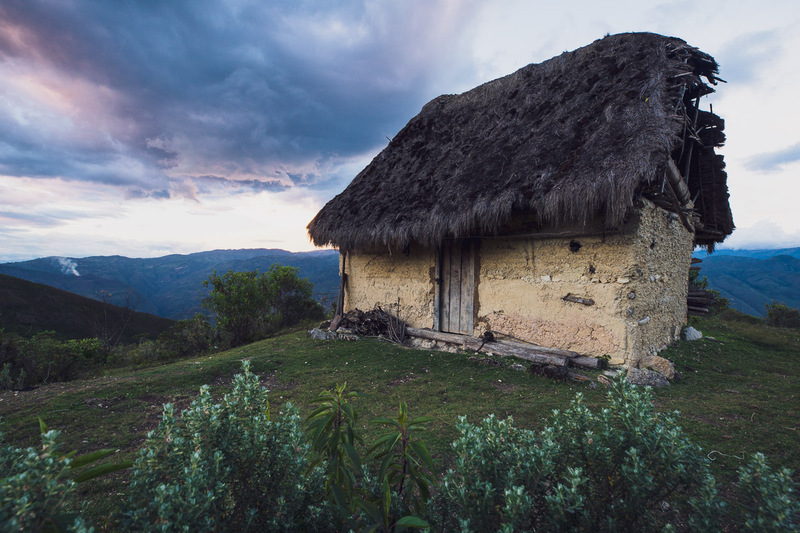 The next day we went our separate ways, and Hana and I headed for the most famous Chachapoya archaeological site in the valley, Kuélap. 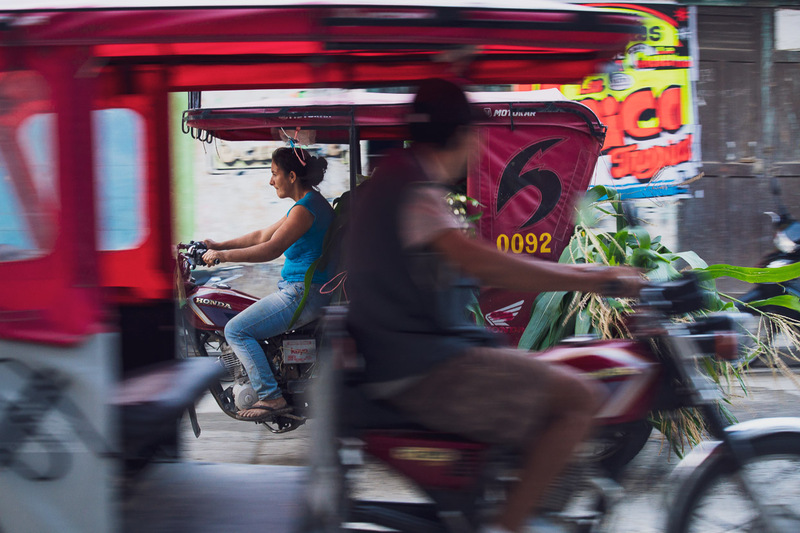 We rode to the tiny village of Tingo and left our bikes at a hostal there and caught a mototaxi up the hill to Nuevo Tingo (built as a safer site for lower Tingo after it was destroyed by a river flood). 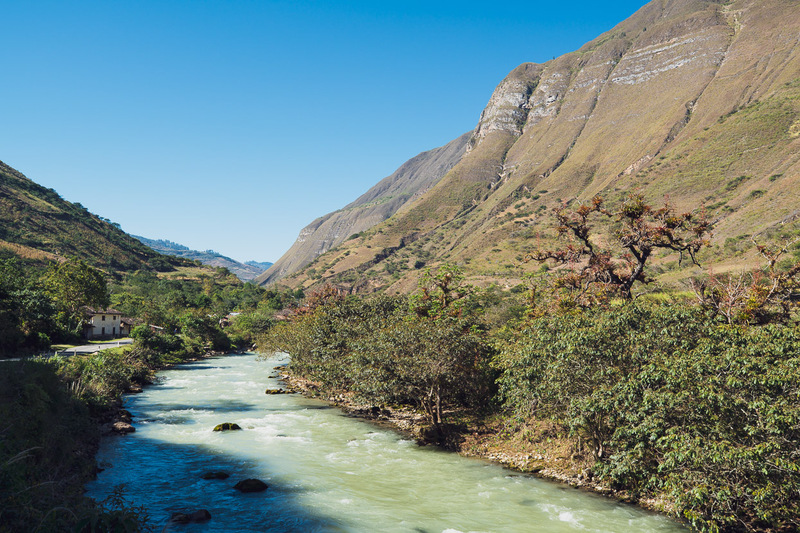 From there you can take a new gondola (Peru’s first) to the Kuélap site. Once accessed by a long and steep uphill walk or a two hour drive on a windy mountain road, Kuélap saw a lot less vistors, but the easier access is well deserved as this is an amazing site. Like a sprawling ruined castle, Kuélap holds a commanding position on the very top of a limestone mountain. 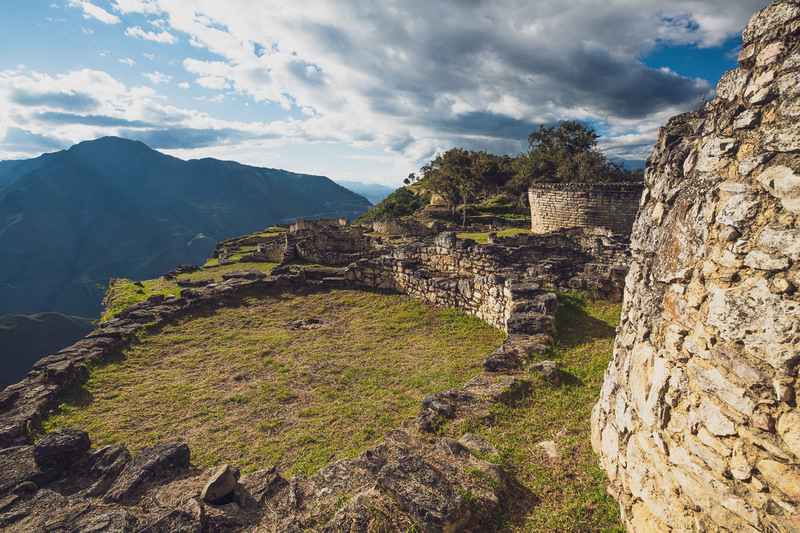 It’s a man-made plateau of 20 metre walls, on top of which sat an entire village. Three narrow entrance channels accessed the village, which allowed only one person to pass at a time, making it easier to defend. Scattered about the site are the ruins of what were once 400 round houses, some of which are thought to have been two-stories. 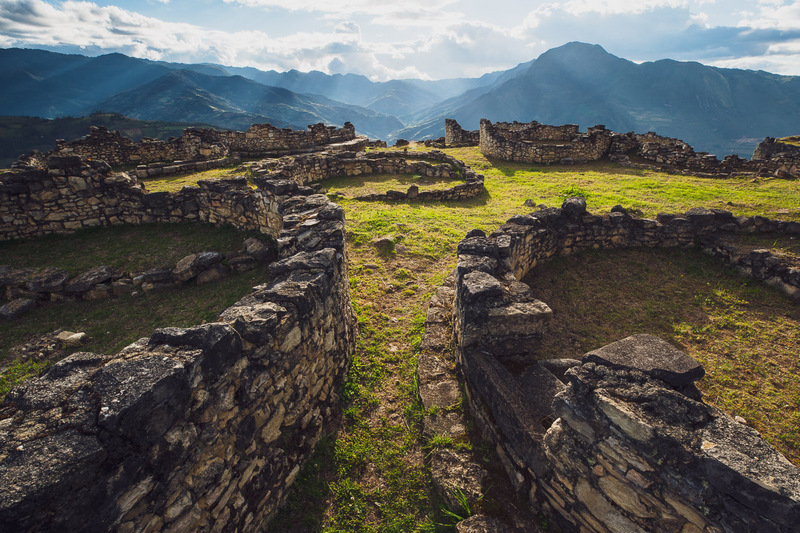 According to radiocarbon dating samples construction started in the 6th century AD and the site was occupied until the Early Colonial period (1532-1570). 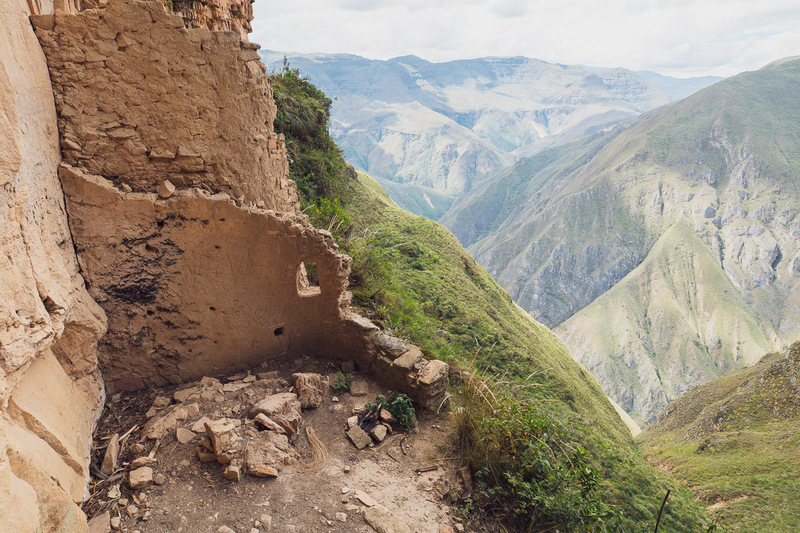 It was invaded by the Inca, and finally abandoned after the arrival of the Spanish. This inverted tower, the most distinctive of the structures at the site, has been named the Templo Mayor by archaeologists. 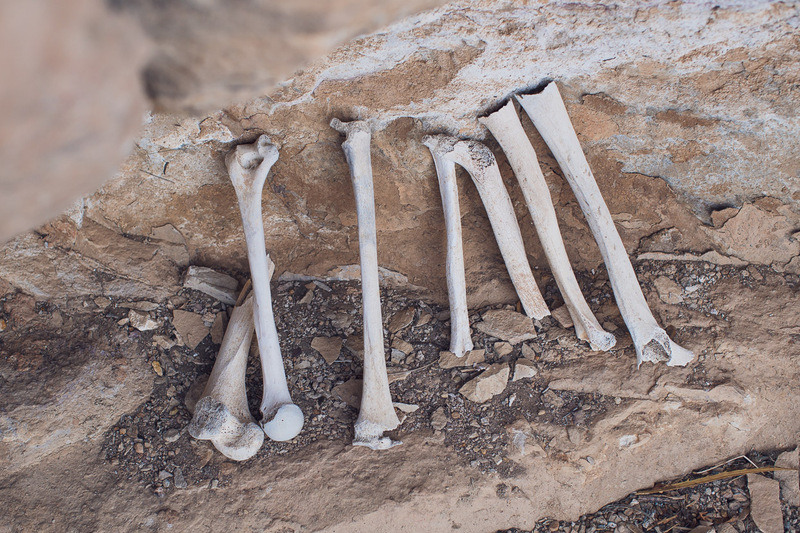 It’s one of the most important sacred centres of Kuélap, and is the entrance to a below ground level pit that was used for rituals, including the offerings of human and llama bones – effectively a big ossuary. 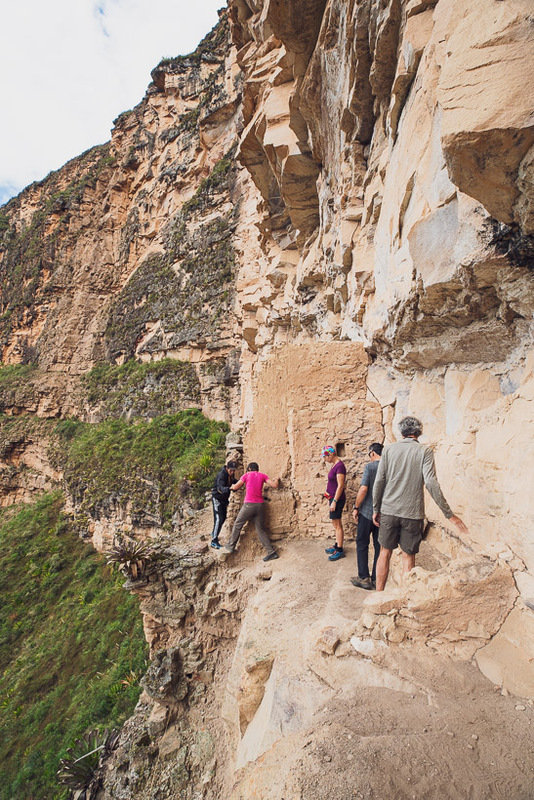 Found around the building were human burials and offerings that came from the north coast, the mountains of Ayacucho in the south and Cajamarca in the northern sierra. 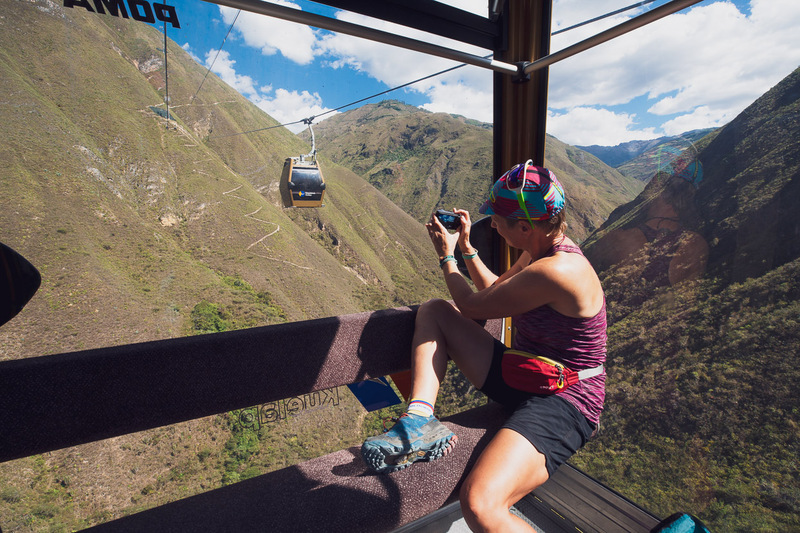 We’d taken one of the last gondolas up, so had the site virtually to ourselves for two hours. 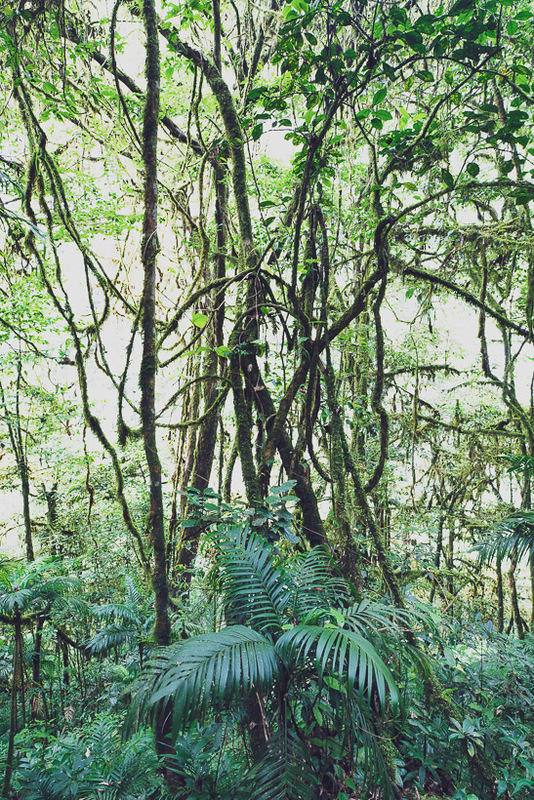 We left at closing (5pm) and made a 2.5 hour walk back down the ridge track that leads directly to Tingo. It was a beautiful time of the day to walk down, as the sun set and the sky purpled. 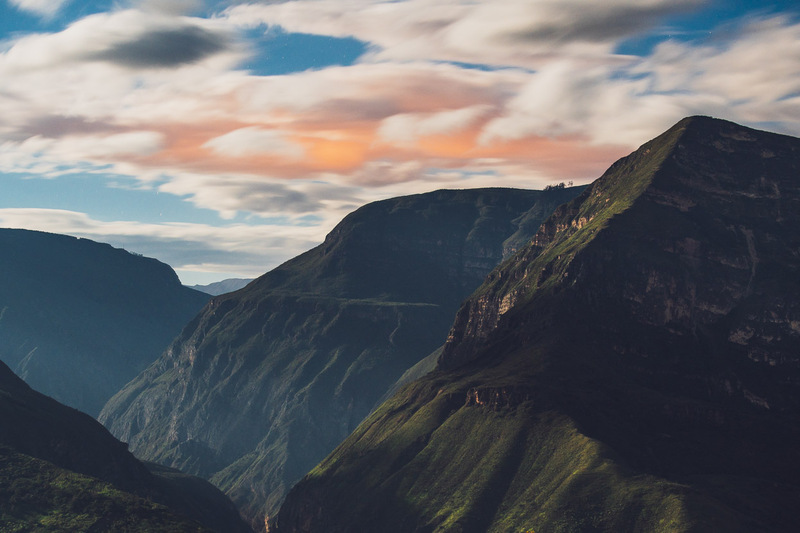 Looking down on Nuevo Tingo and the canyon. 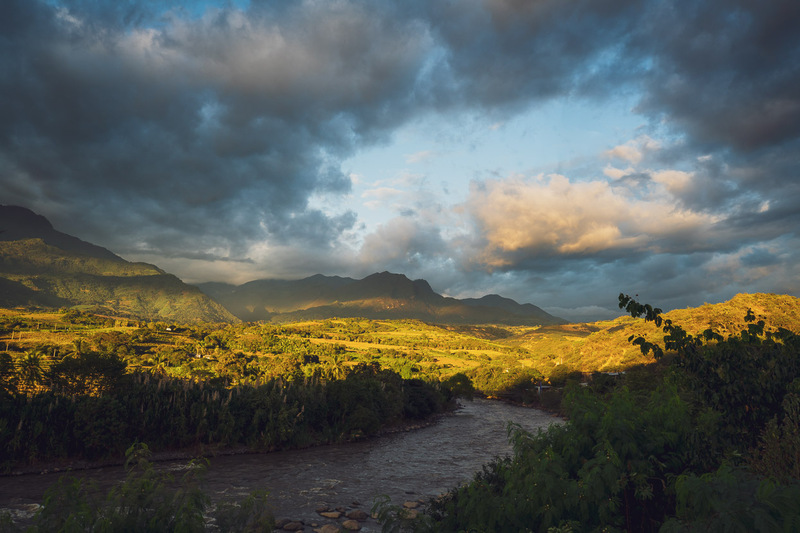 A beautiful morning followed the next day as we headed further up valley, past an ever shrinking Rio Utcubamba, to Leimebamba. Leimebamba’s another cruisey and very ‘local’ town, full of cheap restaurants, small tiendas and people chatting on street corners. For most travellers it’s an overnight stop for a visit to the famous museum up the hill from town. 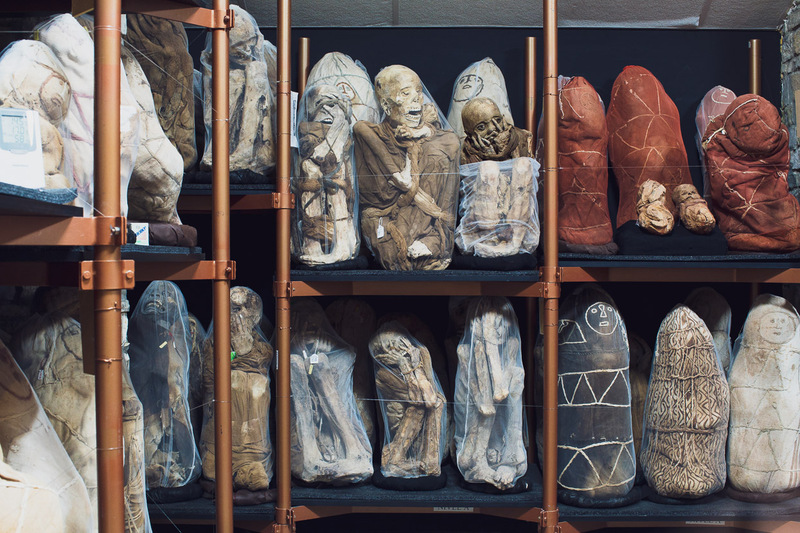 The museum was built to provide a place for the preservation of mummies and archaeological materials recovered from nearby Laguna de los Cóndores in 1997. 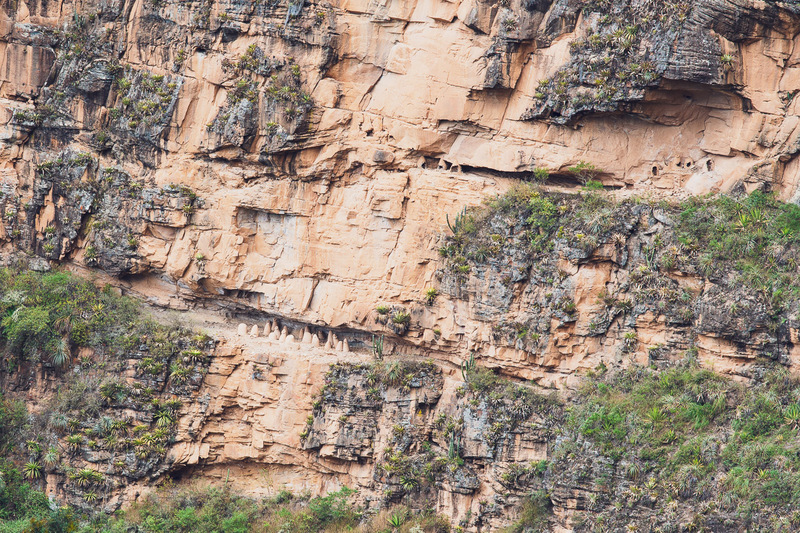 The laguna was home to the Chachapoyas people for over 500 years and here they ceremoniously mummified their dead. 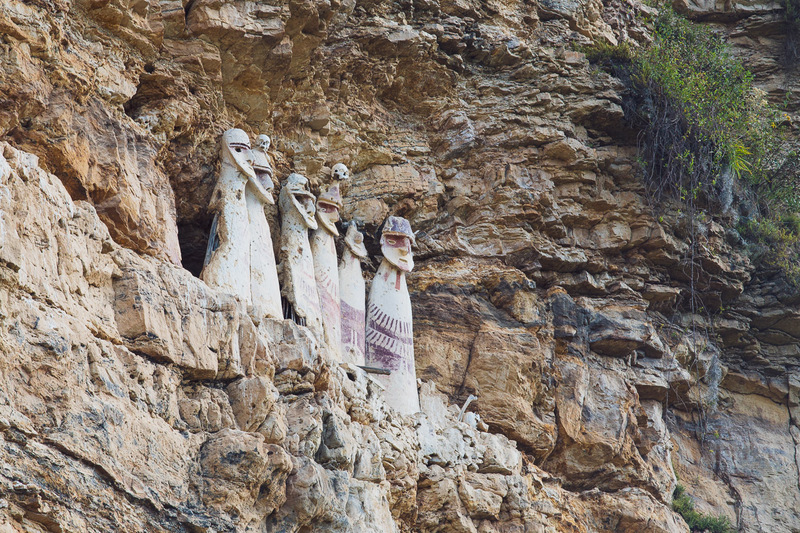 Scattered around the steep cliffs bordering the lake were discovered many different caves, thought to have held over 200 mummies in total. It was discovered that looting at the site had begun, so to protect the tombs and artefacts from further damage they were relocated to this museum. 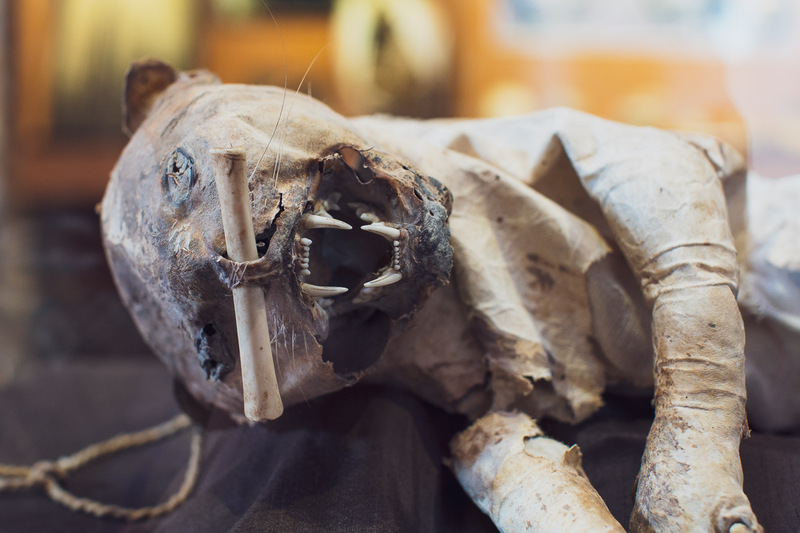 Not only humans were mummified, but also this ocelot (with a bone through its nose) and there was even a mummified guinea pig (yes guinea pigs were a local staple even back then). Just in case you wondered, the mummification process was facilitated by the removal of the guts and brains of the dead before entombment to prevent rot and hence, animals being attracted to the tombs. 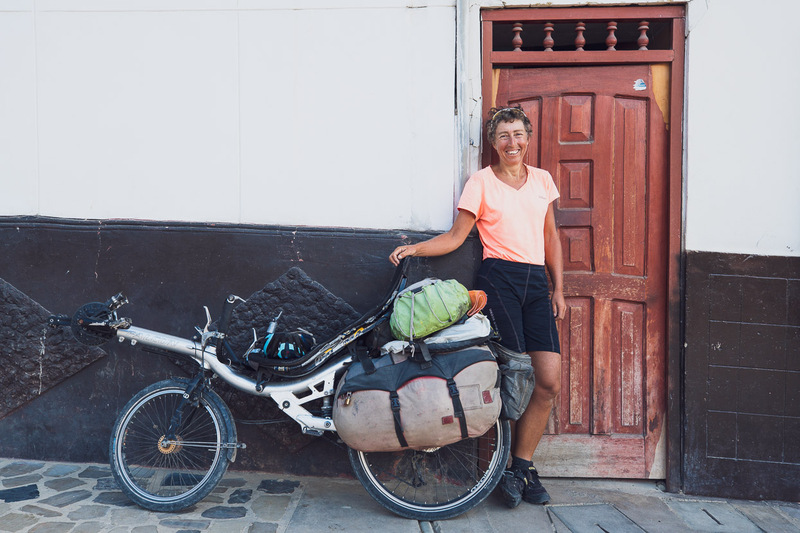 On a more cheerful note, in Tingo we met – quite by chance – a fellow cycle tourist Nathalie. 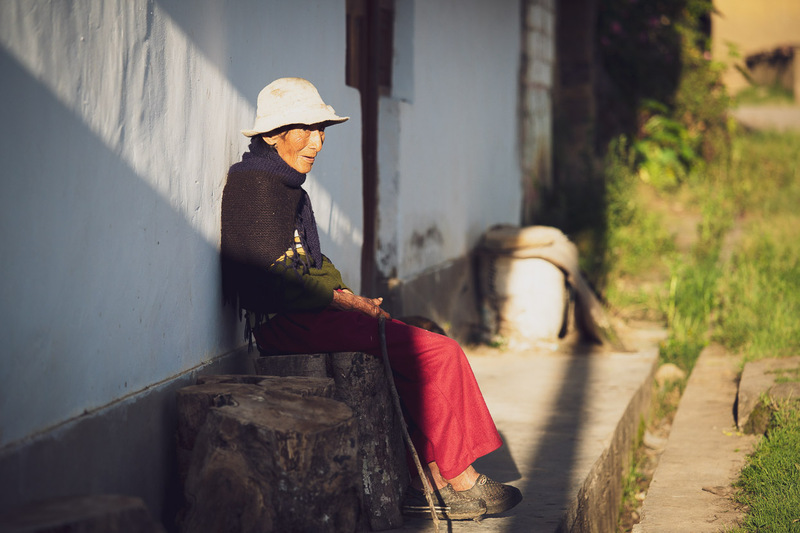 It took us a little while to click, but we’d actually met before on a remote Chinese mountain road in the foothills of the Himalaya. That was in 2011, and Nathalie was on a tour with (her now ex) husband. Seven years later we meet again in an equally out-of-the-way place. 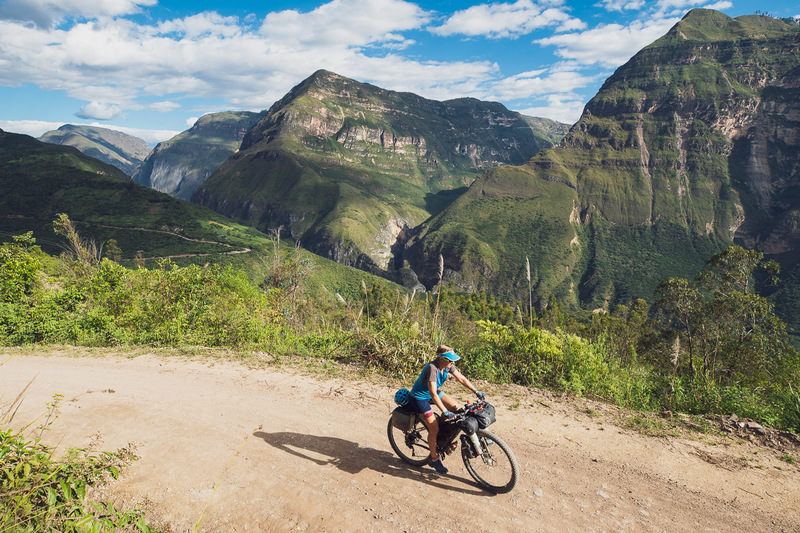 The world feels quite big when you venture around it by bicycle, but sometimes it’s certainly small. Do you enjoy our blog content? Find it useful? We love it when people shout us a beer or contribute to our ongoing expenses! Creating content for this site – as much as we love it – is time consuming and adds to travel costs. Every little bit helps, and your contributions motivate us to work on more bicycle travel-related content. Up coming: camera kit and photography work flow. Thanks to Biomaxa, Revelate Designs, Kathmandu, Hope Technology and Pureflow for supporting Alaska to Argentina. quite amusing to see this “Chiemsee” T-shirt in Peru, I live 35 km away from this South-German lake. I like the light conditions you had in Kuelab, I guess you brought head torches for your way back? Needless to say the missing roads near Bellavista (and some more around) are now on OSM and the ferry connetion to El Valor as well. All of my images are available for sale. For online stock, go here. Please contact me for prints and image requests. Receive the latest blog post by email. Subscribe to Highlux Photo & never miss a blog post.